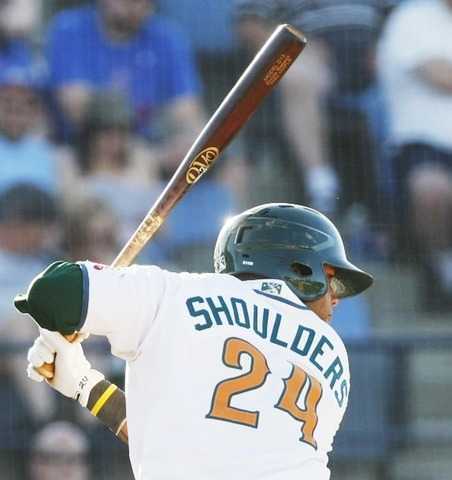 Roderick “Rock” Shoulders is a first baseman for YOUR Boise Hawks. For those who have been wondering, the name “Rock” came from his friend’s mother at the age of six because she was not able to pronounce Roderick. “Rock” naturally took its place and has stuck with him ever since. Rock didn’t start in baseball at first, he played soccer at the age of four but he didn’t like it. In his hometown you had to be five before you could play t-ball and that is when it all started. Growing up Rock went through the motions moving from shortstop to third base, then to catcher and finally first base. Rock went to the State College of Florida for one year before being drafted by the Cubs. If he wasn’t playing ball he would be back in school to become a PE teacher so that he could coach. “The only thing special about me is my name.” Rock sees his life as being average and a good one. He looks up to his father the most because he has taught him everything he knows. However, the most difficult thing for him to go through has been his twenty-five year old sister leaving for the Air Force. “I knew she would be gone for six years and I would probably only see her once a year.” They share the connection of their birthdays being just two days apart (and a few years). Rock has a few interests outside of baseball including fishing, video games and fashion, anything but sleeping. Rock is a shoe fanatic! I asked what he would get for a senior superlative (for those who don’t know what those are, things such as most likely to succeed, etc.) and he responded with “the best dressed.” Rock’s style consists of Ralph Lauren Polo’s, True Religion or Rock Revival jeans (fitting right), and Nikes or Chuck Taylors. In Boise Rock loves being at the field, going to the mall and hanging out with his host family. He says that he is part of the family, “I play videogames with the boys all of the time, I fit right in.” Rock lives with Donna Johnson and her two kids Mac and Nate Johnson. He says that the family is the best part and getting to drive a two door Lexus is just a plus. Rock is currently in the run for the 2012 MiLB Moniker Madness, best name in minor league baseball. Go to Milb.com and vote for him today!